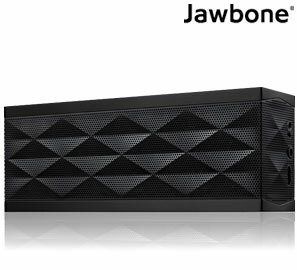 The new BlackBerry Music Gateway connects to your existing stereo or speaker system letting you wirelessly stream music from your BlackBerry smartphone or other Bluetooth enabled device. This newly updated version features a slimmer design, expanded connectivity and of course, NFC. A revamped version of the original BlackBerry Remote Stereo Gateway, the new model brings everything up to date by adding NFC and a microUSB charging port. You can easily stream music from any Bluetooth device including your BlackBerry smartphone, BlackBerry PlayBook, Android device, iPhone, iPad, Mac, PC or Bluetooth-enabled MP3 player. Use the BlackBerry Music Gateway to DJ your party, set the background for date night or even as bigger sound for streaming audio from movies or games. 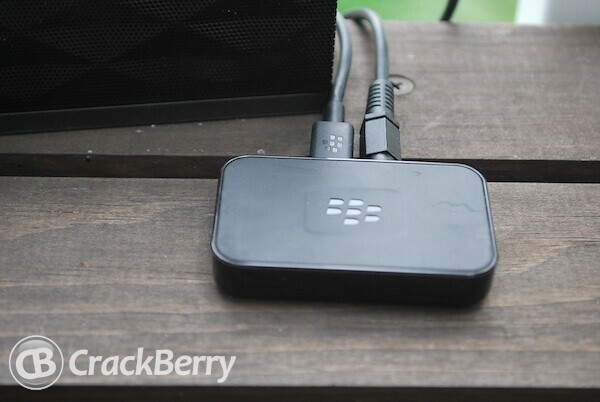 Keep reading and we'll see just how easy it is to use the new BlackBerry Music Gateway. I really do love the BlackBerry Music gateway. 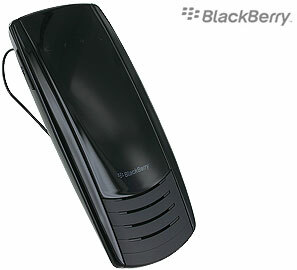 It makes it super easy for anyone to wirelessly stream audio from their BlackBerry with little to no effort. I have plenty of speakers around the house that are already in use, so by adding on a 3.5mm cable (included) I can have a great wireless setup for streaming my music as well. The device itself doesn't look like much - weighing in at just 0.8 ounces, it's not much more than a small black brick (which is totally what you want). Measuring only 0.4 inches tall and 1.5 inches deep, it easily blends in with your existing setup and is truly a minimal accessory. On the back you'll find the 3.5mm jack and microUSB charging port. On the front is an LED that will let you know the state of the device (pairing mode, connected). 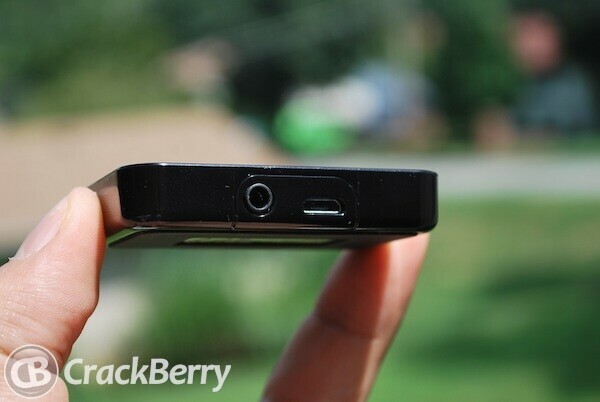 The top BlackBerry logo also acts as the function button for pairing non-NFC devices. The device streams audio from any Bluetooth device to a connected speaker. Unfortunately it won't work the other way around (ie. stream from a connected device wirelessly to a speaker). You can pair up to six separate devices with the unit, however only one can be active and in use at any time. This is great if you're a multi-device household, as you don't have to worry about removing and pairing devices constantly. 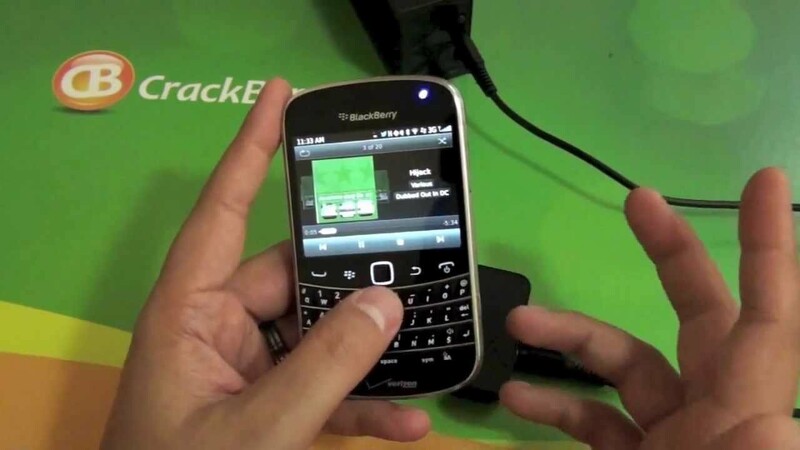 If you have a BlackBerry with NFC, this is an amazingly easy process as well. 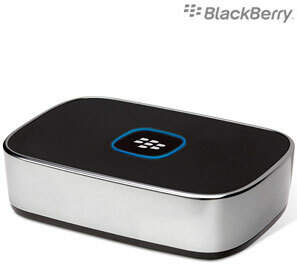 Just turn on NFC and tap your phone against the BlackBerry Music Gateway. You'll see a connecting message on your device, then a fun tone letting you know you're good to go. After that, fire up any music service on your device - the built-in music player, Pandora, Slacker, Spotify, BBM Music -- and stream away. Use your phone as a remote to control the tunes up to about 30 feet away. While you can't actually stream video from your device, you can use the BlackBerry Music Gateway to stream the audio - so you can use an external speaker to get great sound when watching movies on your device. The quality for me is top-notch, but that obviously varies depending on your speaker setup. Most times when I was within range of about 30 feet or (even more at times) I had no issues. Moving too far away from the unit or having walls/doors in between can get sketchy though -- then the audio gets choppy or just drops off completely until you get closer, so that is just something to be mindful of. 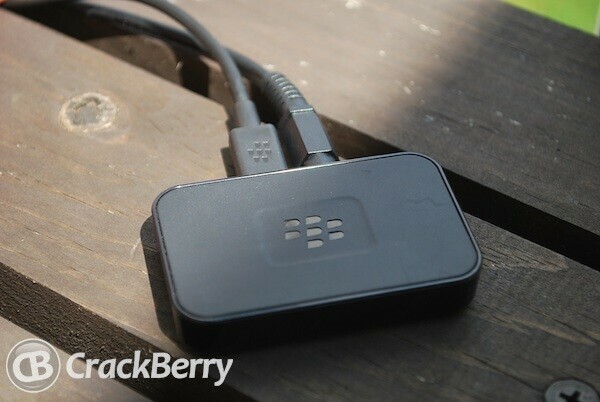 You can use the BlackBerry Music Gateway in countless places. At home for audio when hooked up to an external speaker or stereo system, in your car (providing you have an AUX jack), with a battery powered speaker outdoors ... the list goes on. Any speaker/stereo with an 3.5mm jack will work with this guy, and any Bluetooth enabled device like an iPhone, iPad or Android device can be paired with it. Overall for the price this is one sweet accessory. Being able to stream music from your device without wires is pretty awesome, and the ability to connect via NFC just makes it that much easier. It's small, doesn't require much setup and it just plain works. "Great hands-free device for any vehicle."